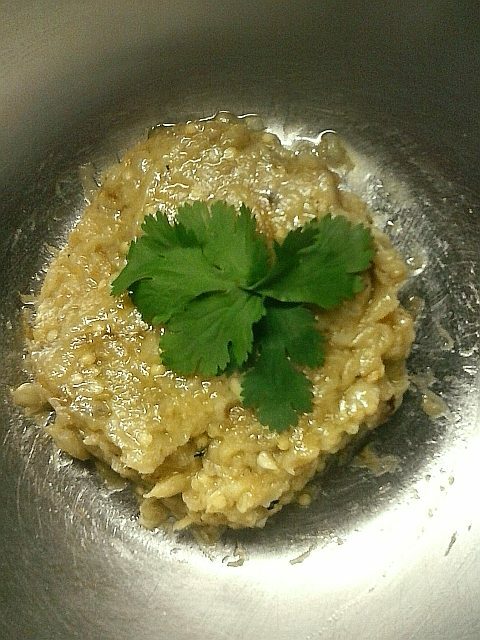 Day 9: baba ganoush, or aubergine dip, is real weekend cooking. A bit fiddly, and be sure to reserve some extra time to clean the stove: you get the best results grilling the aubergines directly on the gas rings. It is all worth it, for the smoky smell in the kitchen alone. The texture and flavour is totally unlike the baba ganoush you can buy in the supermarket. Cutting the aubergines with knives (use two at once for speed!) instead of blending makes the texture silky, yet slightly chewy. You will need more aubergines than you could imagine. Reckon on one a head, and that is in combination with some other dips and things. Roast the aubergines on a gas ring each, turning as they blacken, until completely softened. This will take about 15 minutes depending on how thick they are. Allow to cool. Peel off all the skin using a sharp knife. Discard the stalk. Put into a bowl and cut with two sharp knives until reduced to a pulp. Add the garlic and olive oil and half the lemon juice. Season with the salt and pepper. Taste to see if it needs more lemon juice. Leave for the flavours to blend and serve at room temperature.